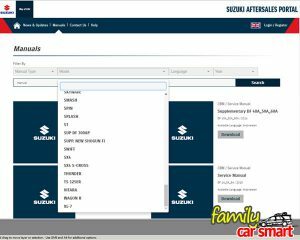 Suzuki Indonesia, through PT Suzuki Indomobil Motor (SIM) /Suzuki Indomobil Sales (SIS) has launched a website called Suzuki Aftersales Portal that provides manuals and other documents to help workshops /customers with their cars. Also available manuals are repair manual downloads. Site address is at the bottom of this article. The site provides a lot of manuals, from motorcycle, outboard engines, to cars, up to the latest 2016 releases (see picture). Indonesian Suzuki customers should be happy with this Suzuki efforts. There are also some news or promotional materials on the opening screen. The portal is made available in English, Indonesian, Vietnamese, Chinese, and Thai languages. Most contents of the site is in Indonesian (Bahasa Indonesia). So are the downloadable manuals. Only few of the manuals are available in English. There is no info on manuals available in other languages, as we did not dig deeper into the manual depository). A subscription is required for access. There are 3 membership types, a Distributor (an overseas dealer, rewuires distributor code), a domestic (Indonesian) dealer (requires Suzuki Employee Number), and Individual User (customer). Annual subscription fee is Rp 100.000 (USD 8) plus tax and service charge. Payment can be made with credit cards, DokuWallet (an electronic wallet service), ATM /bank transfer for select domestic banks, and AlfaGroup (domestic minimarket network). The annual subscription allows an individual customer to download only owners manuals without additional fee. Service (workshop) manuals and supplementary manuals are optional, which can cost up to Rp 500.000 (USD 38) each. Ouch. The site provides help through its administrator, and promises a reply for help within 2×24 hours on workdays, during work hours of 09.00-16.00 (predictably this is GMT+7 time). We tried to contact the administrator through email after registration and got a response in 24 hours. We registered as an Individual User, which cost a total of Rp 117.200, (USD 9) per year. Activation of membership was not automatic. Later we contacted the site administrator through email (we waited until 09.00 when work hour starts), and received an activation confirmation the next day. 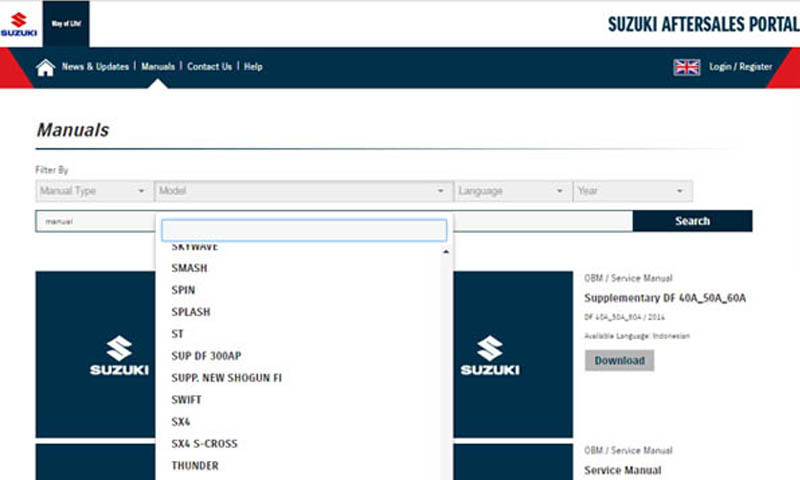 The reply included a Suzuki Aftersales Portal operational module (which is a manual too). Overall, the portal is quite an improvement to boost customer’s experience with the brand. While some car makers limit customer’s access to manuals (especially workshop manuals), Suzuki has shed a light on the right direction. It’s worth every cent. Access to the site can be made through https://suzuki-aftersales.net.